The Oakland Lawn Bowling Club, established in 1903, is now housed in Lakeside Park along the shores of Lake Merritt. Too bad no one was playing the day I walked through the park. But I took advantage of the sunny day to snap the tiled murals that decorate the clubhouse. This mural is signed R. Howden, whom I believe to be Robert Howden, owner of the early Oakland tile company previously featured here. They have lawn bowling near where I live. I like the dressing of all in white they do. There are so many sights in Oakland that you featured here that I haven't seen. I should come out of my work place more often. Hi Carolyn, I finally joined! Thanks for this meme, I truly enjoyed taking photos of mural. I love the fact that you must go out daily to take photos to post. You find something new and different to share. There's something zen about lawn bowling, especially as the players all dress in white. This tile mural has a nice vintage feel to it. PS. I am having trouble opening Ewok's blog, whether I use the linky, her name in the comment form, or type in her URL to get there. Is that just me here behind the firewall? Great find and the mural is a magnificent work! What a wonderful lively mural! I am always amazed when art work is done with tiles. Present day lawn bowlers still dress neat and tidy just like the man in the mural. Can you imagine wear a bowtie to a bowling match? 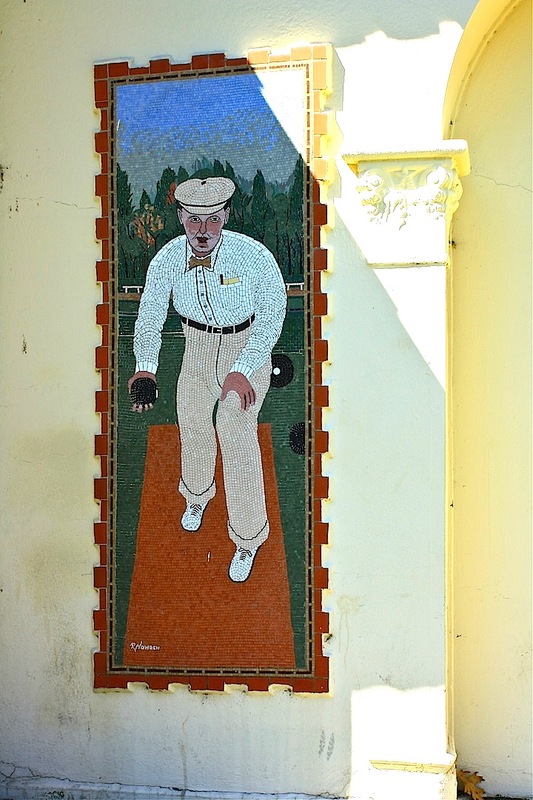 Your tiled lawn bowler reminds me that a wall mosaic can be considered a mural. So I'd like to contribute the big one in Jerusalem's Church of the Holy Sepulchre that was made for the Millennium 2000 celebrations and Pope John Paul II's visit to the church. Love Tile murals, this guy is really sweet. My uncle was a long time lawn bowler - was a gentler sport ever invented? I like these old-fashioned scenes. This is a nice mural. How interesting! We need more murals in our lives! Love this idea for a meme! I'll be on the lookout and I've bookmarked you so I can join in. I just discovered this meme. I have lots of saved shots of murals so I will try to remember to join up next week. It is such a proper pastime. Great mural. Love this - reminds me of my dad.